Self Determination Party in Kosovo has held a series of meetings with its supporters all over the country under the slogan “Down with this government of thieves”. 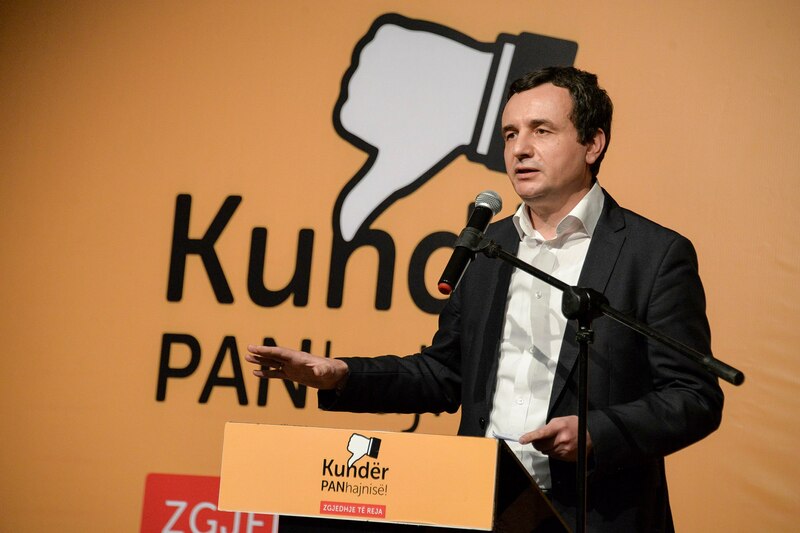 In the numerous meetings that he has had with party faithful, chairman Albin Kurti has demanded “fresh elections to put an end to this regime”. In last night’s rally in Gjakova, Kurti has criticized the current government over things like corruption, nepotism, failure in European integration processes, diplomacy, etc. “No high profile official has ended up behind bars on corruption charges. Corruption is everywhere and the prosecutor’s office is the only one not to see it”, said the leader of Self Determination, adding that the government has also failed with the EU integration process. “In February 2018, the government declared that by the end of 2018, Kosovo would be given the EU candidate status, but we haven’t seen anything yet. The government has also failed to implement one third of the Stabilization and Association Agreement program”, Kurti said. According to him, the only way to end this is to hold new elections. Meanwhile, Democratic League of Kosovo and its leader, Isa Mustafa have also demanded fresh elections. Mustafa has declared that this government does not have the legitimacy to make the country advance. On the other hand, current PM Ramush Haradinaj said that his government has seen better results than the previous government.